2 Bedroom Flat For Sale in Yeovil for Offers in excess of £135,000. 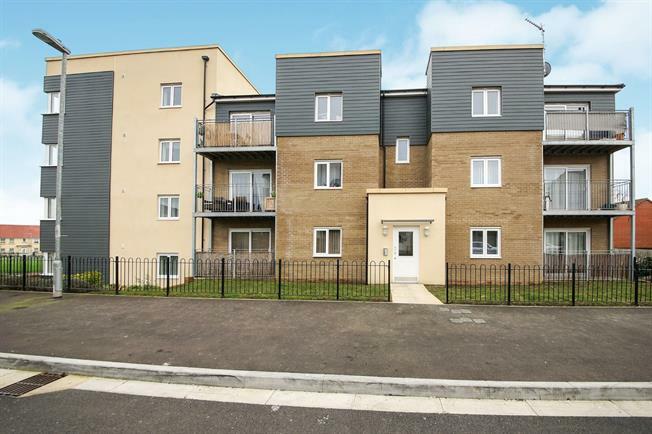 A modern two bedroom apartment offering spacious accommodation throughout comprising: entrance hall, open plan lounge/ dining room, contemporary kitchen, spacious master bedroom with built in wardrobes and balcony, a further good size double bedroom and an elegant bathroom. The property further benefits from gas central heating and double glazing, early viewing is advised. Fully carpeted, with wall mounted digital thermostat. Panelled doors leading to Kitchen, Bathroom, Living Room, Master Bedroom, and Bedroom 2. Telephone for building access. Access to storage cupboard housing gas and electricity meters. Access from the main hallway into a U-shaped kitchen. Which includes a full integrated gas hob, and electric oven. Stainless steel sink with side draining. Double glazed window with views to over the communal areas. Dedicated sections for fridge/freezer, and washing machine. Panelled door access from the hallway, with radiator and double glazed window overlooking the front of the property and communal play area. Fixed sky and TV aerial ports, with 4 double socket power points. Accessed from hallway, with laminate flooring and tilled walls. Includes bath with overhead mains powered shower. Toilet, sink and Vanity mirror and cupboard. Additional storage cupboard. Also includes electric extractor unit, and frosted window. Accessed via main hallway, with single radiator. With floor to ceiling sliding doors to exterior decked balcony. Fully carpeted, and 2 main double power sockets. Secure fully decked balcony accessed via master bedroom, with railings.